That moment of relevancy when a user is looking to make a purchase is the ideal time to serve an advertisement. However, on Twitter, as is the case anywhere online, intent is hard to judge, but one startup called Compass Labs that launched this week at Techcrunch Disrupt in New York, has built a system that its founders believe can analyze intent to provide highly relevant ads right in a Twitter user’s stream. We have to say that we were impressed with what Compass Labs demoed at Disrupt. When we were talking to Venkatachari after the demo, however, we discovered that they had impressed us by mistake. During the demo, Venkatachari typed in a sample tweet saying “I’ve been following this cam lately” – he had intended “cam” to mean “camera” but actually a cam is a very specific piece of mountaineering equipment – but in actuality, it worked out better in our minds, because the ad that Compass Labs served had to deal with an Everest expedition. Doubtful anyone else picked up on this, but for us, it actually made the service more legit as it showed a very targeted ad in a relatively small vertical. One of the interesting angles that Compass Labs brings into the Twitter ecosystem equation is that they plan to go after partherhips / deals with the various Twitter clients (they demoed what integration with Seesmic may look like, although Seesmic isn’t a partner/client at present) instead of trying to interject their ads somehow directly into the user’s stream. If Compass Labs starts to do well in attracting advertisers to its platform, the decision to work as part Twitter clients could have two major ramifications on the ecosystem in our view. First of all, this would gives third-party clients a revenue stream that Twitter itself doesn’t have. Secondly, there is a strong possibility that Twitter could decide that they don’t want that (they would of course publically say “we want to maintain the user experience” but let’s be realistic about motivations here) and could possibly crackdown on both Compass Labs and any other similar services that arise. 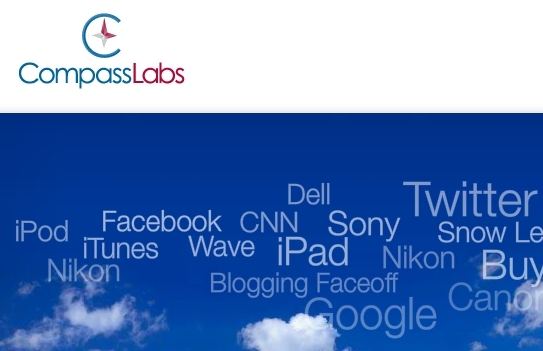 That said, if Compass Labs does work as well as they hope and they attract advertisers and Twitter client partners, it may just make more sense for Twitter to simply acquire Compass Labs and use the technology to make Promoted Tweets better.